STOKLEY'S SERVICES can custom design and install a cooling and heating system designed to keep you comfortable all year round. Since 1938, STOKLEY'S has been keeping Tidewater comfortable with quality products and services. WE SERVICE ALL BRANDS OF HEATING AND AIR CONDITIONING EQUIPMENT! We can install any brand that we want. With our reputation in the area and within the HVAC industry, we are able to choose what brand(s) of equipment that we want to install; not many companies can say that. We will not install inferior products. We feel that to do a job right, you need more than just quality people, you need quality products. At STOKLEY'S SERVICES our goal is to provide the best products and have the best personnel install and service them. We take pride knowing that we are providing the best possible sales, installation, service, and maintenance programs available. 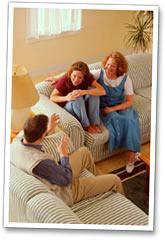 STOKLEY'S SERVICES can design a home comfort system to fit anyone's needs and budget. No one is perfect, even we can make mistakes: however, we stand behind what we do. If there is a problem, call us up and we will correct it. There is no hassle: you don't have to scream to be heard. STOKLEY'S wants to make you one of our many satisfied customers. If you are not happy everyone you know is aware that you are not happy. We are not happy until you are happy! It is easy to say, but we really do stand behind our work. STOKLEY'S has emergency service 24 hours a day - everyday of the year. A technician is always on call and can be at your door in minutes. While it is impossible to have every part on our trucks, we do keep a large supply of the most common parts in inventory. Simply call us and let us take care of the problem. It is as simple as that!